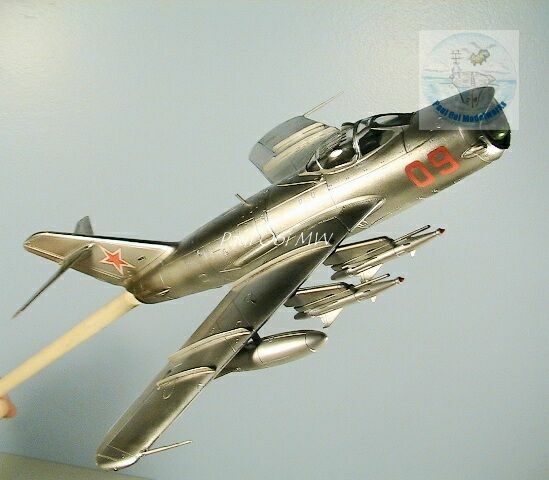 The MiG 17 was a very successful subsonic fighter that came out from the lessons learnt from the MiG 15’s debut over the skies of Korea. 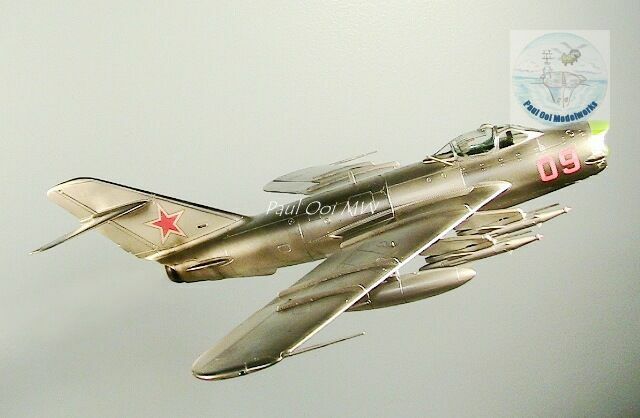 For an aircraft that was introduced in 1952, the MiG-17 has had an incredibly long career that continues to this day with stragglers still being operated by forces in Tanzania, Somalia and North Korea. 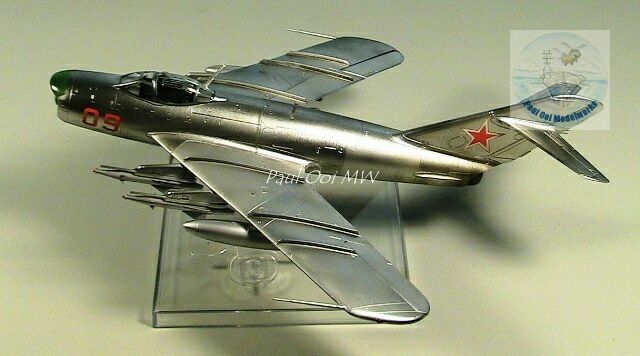 Most of these late day survivors are either Chinese-made Shenyang J-5 or Polish Lim-6, variants from the original MiG 17. 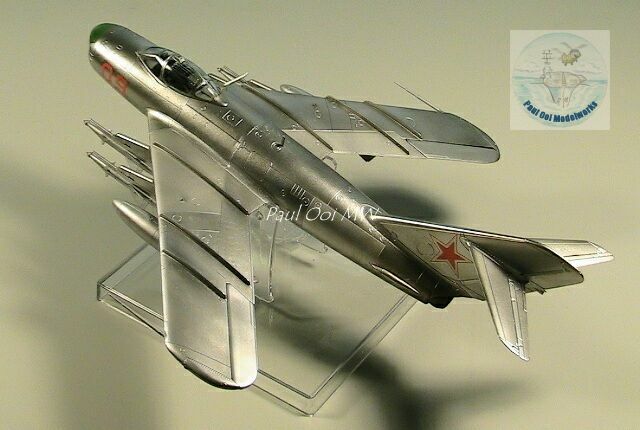 To put this is in perspective, in the same year of 1952 the US Navy jet that came into service was the Grumman F9F Cougar which is relatively unknown today except among Korean war buffs. An American fighter bomber that comes close to this longevity is the Douglas A4 Skyhawk that was introduced in 1957 and is still being operated by several air forces around the world. 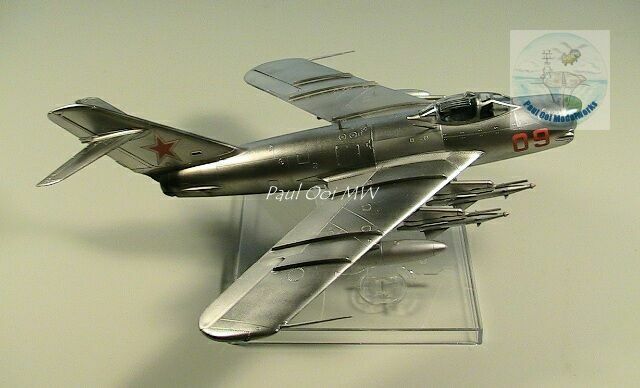 Despite it’s tubby appearance, with the right hands at the controls the MiG 17 was a deadly dogfighter with cannons which accounted for 71 US aircraft lost over Vietnam between 1965 to 1972. 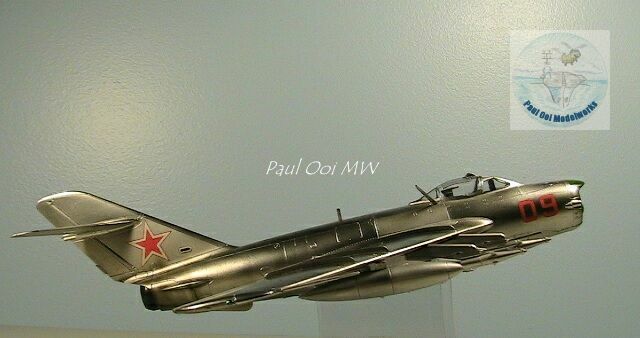 The customer requesting for this project provided a Hobby Boss 1/48th scale Mig 17 PFU Fresco “E” for the build. 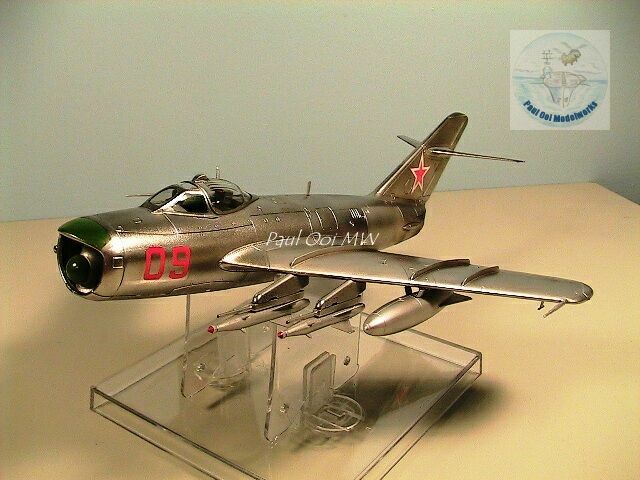 This version was the only MiG-17 to be be equipped with an early Soviet air-to-air missile NATO code-named “Alkali”. The latter was not very reliable, and the pilots were still reliant on their cannon as the main weapon of effect. 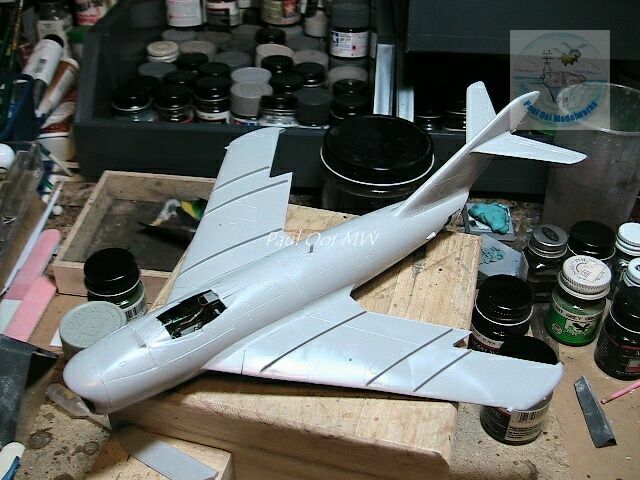 Since he wanted the aircraft build in mid-flight with all the wheel wells closed, one would imagine a simpler build without all those fiddly undercarriage parts. However, since this kit was engineered for the wheels to be down, the flaps lowered, and air breaks displayed, I had to make the effort to make the door pieces actually fit together into the wells. More of that later. 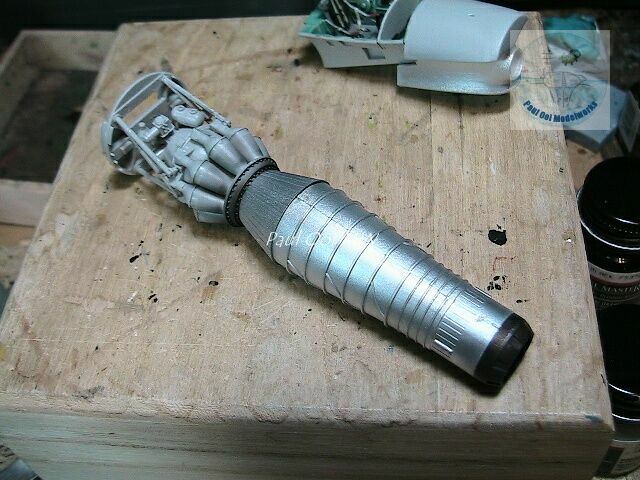 The cockpit was built out-of-box with the bare details provided by the kit. 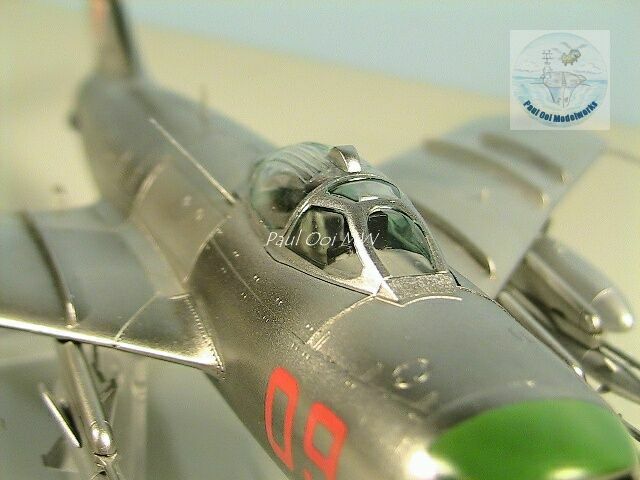 After looking at various pictures of the MiG17 cockpit interior, I decided that the main panels will be Soviet interior green blue while the ejector seat will be medium grey. 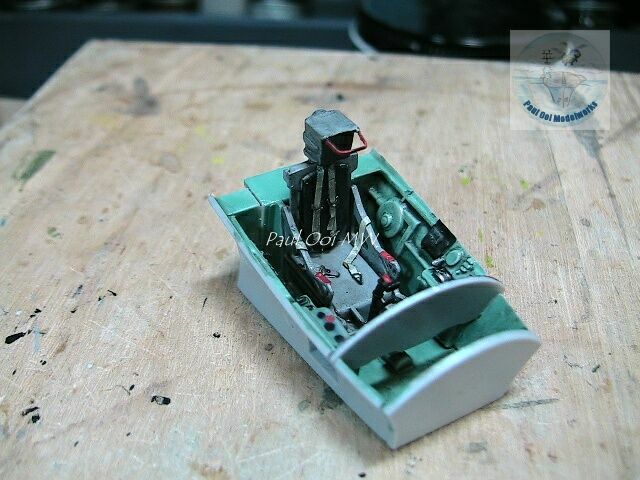 Instrument panel was painted black, and then highlighted in silver with white markings for the dials. Ejector seat details were enhanced with masking tap seat belts and the hoop above the ejector seat was made from a recycled photo-etch fret. Some of the dial details and emergency signs were painted in signal red. 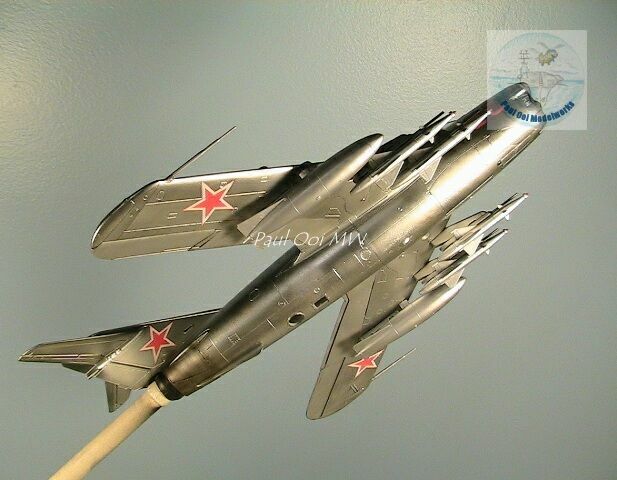 The next item was the VK1 engine which was very similar to the one used by the MiG 15. 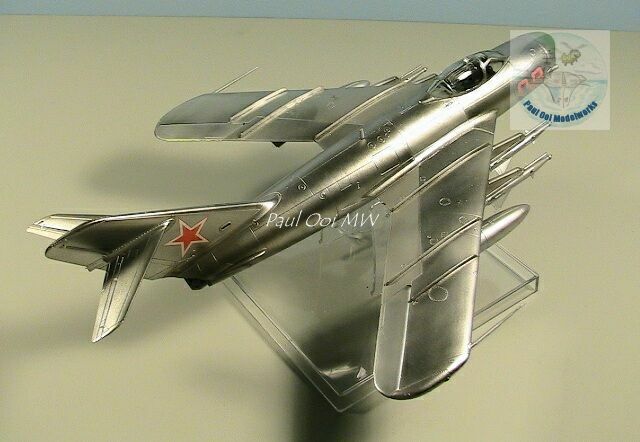 It is such a pity that this entire assembly with fantastic engine details would be totally enclosed in the fuselage and will not see the light of day (except for a very small clear window on the underside of the fuselage). Ever the stickler for faithful construction, I went ahead and built it anyway. 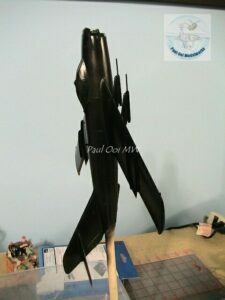 The fuselage parts are relatively straight forward, wrapping around the main engine assembly which constitutes 2/3rd of the fuselage length. 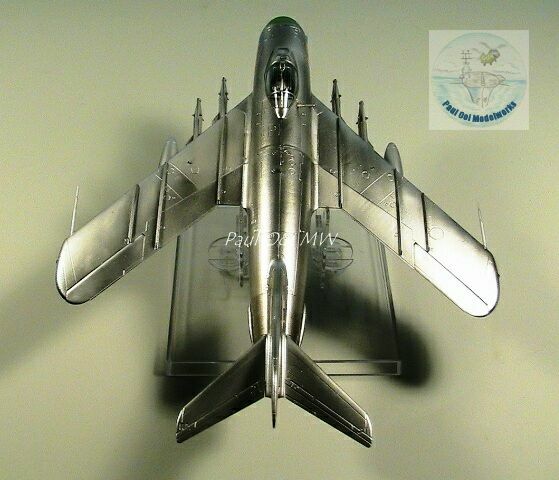 I airbrushed the engine assembly in shades of burnt iron and the combustion chamber walls in dull aluminum. There were not many locators to help in fixing the position of engine into the rear fuselage section, so a lot of dry runs were the order of the day. 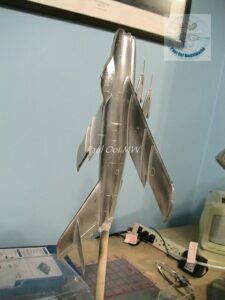 This paid off as the assembly fitted snugly into the fuselage halves and the tail exhaust looked “right”. 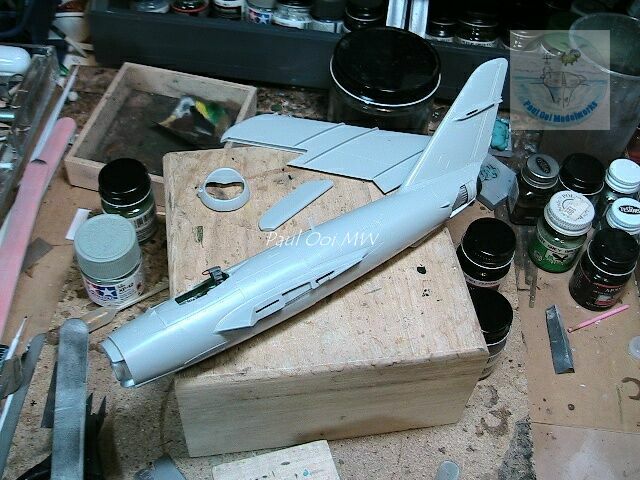 Once the fit is good, the whole rear fuselage assembly gets clamped together while the joints cure. 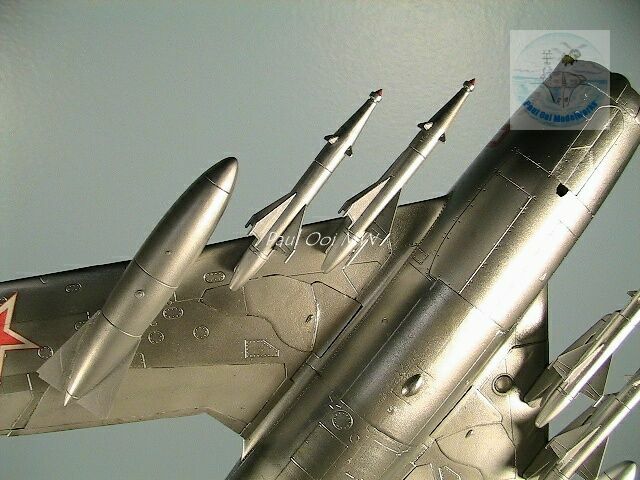 The fuselage halves were very thin shells and so full force clamping would create distortions. Finally I managed to rig up the assembly by using a combination of tape and clamps to get as close as possible to the final effect. 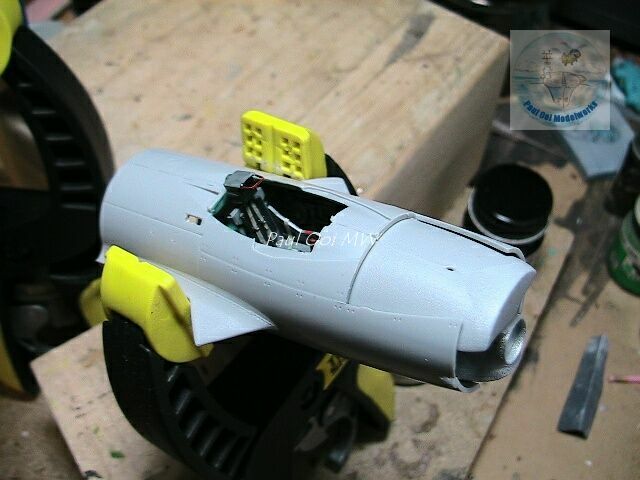 Similarly the cockpit gets mounted into the front assembly of the fighter. What I noticed later was that two separate good fits (from and back fuselage sections) do not necessarily ensure a good fit for the entire fuselage. 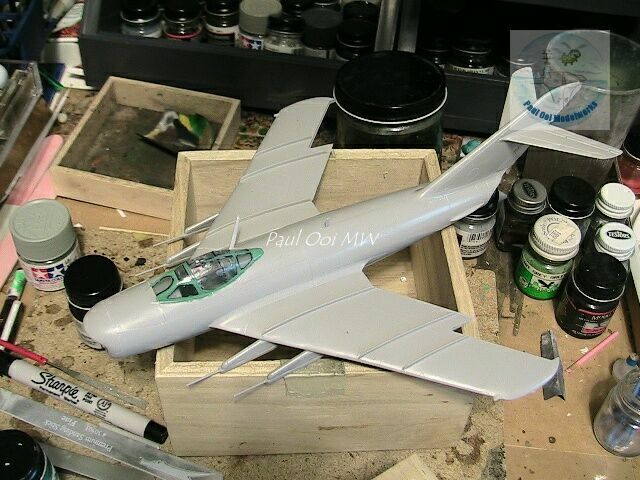 As it turned out the rear half of the fuselage was a little flatter across the width of the fuselage. When joined together, there were significant gaps that needed to be filled! 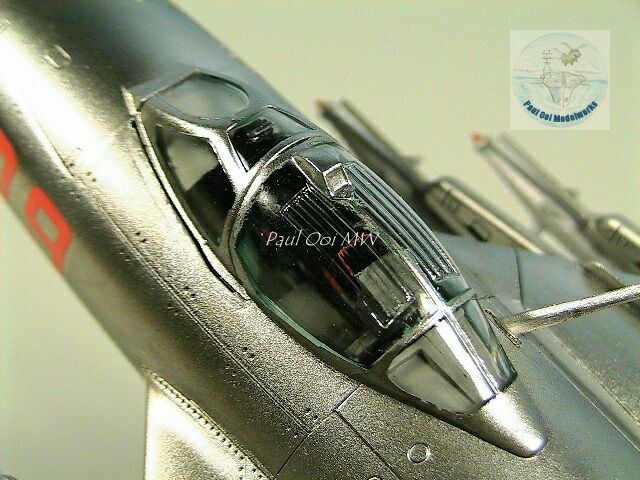 The fuselage fit of this model was a challenge, and since we wanted to paint this a beautiful polished aluminum, a lot of gap filling, sand-papering and re-scribbing of the panel lines were in the cards. Once we joined the wings, more gaps were found at the wing roots. 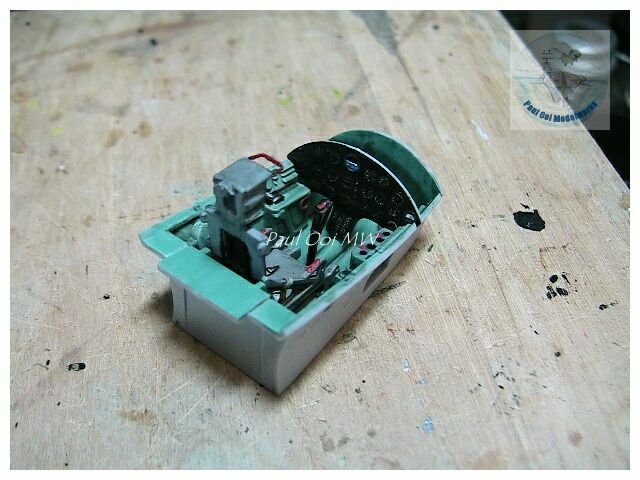 Most of the assembly time for this kit was spent gap filling and cleaning the seams. Earlier I had mentioned the challenge of fitting the 3-piece doors into the wheel wells to make them fit and flushed. These had to be carefully fitted, sealed and then sand papered flat. 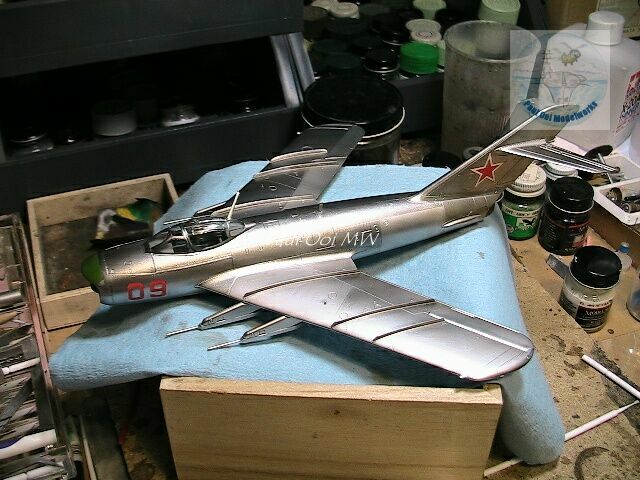 When the seams were tidy, the whole aircraft body was polished with plastic polishing compound Novus #2. 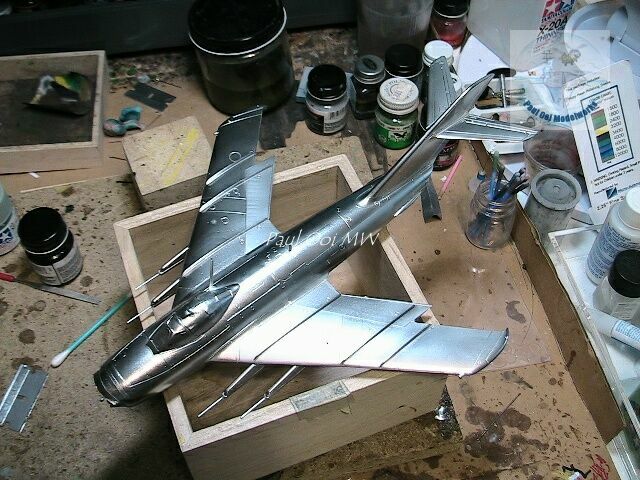 After polishing was done, the aircraft was prepared for the spray booth. The canopy sections were masked and the air intakes stuffed with wet tissue paper. 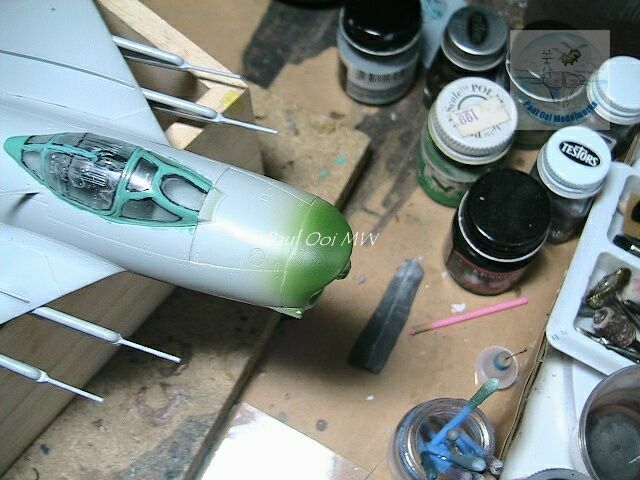 I under-coated the canopy frame section with interior green blue paint. 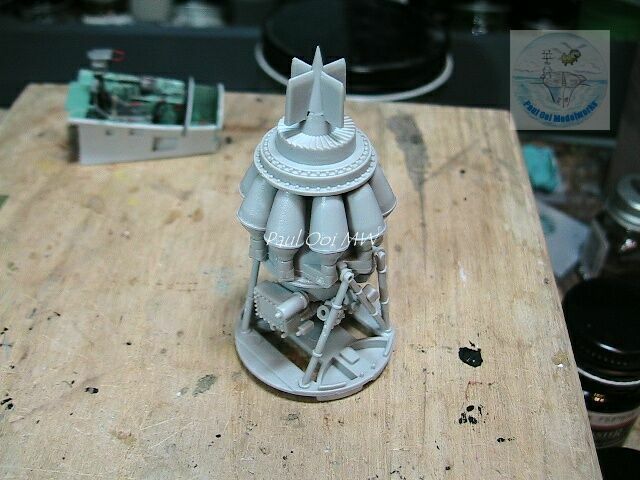 Later on this will be over-painted with the black gloss primer. 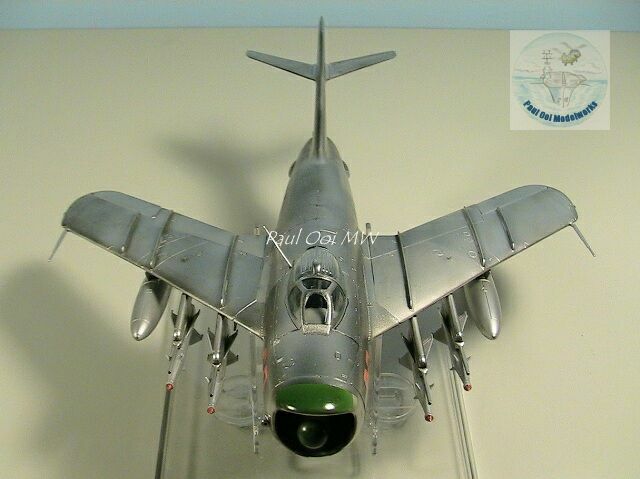 The next step was to spray on the sections of Medium Field Green (FS34095) on the leading edge of the nose and the radar dome. Once this is dried properly, I masked them in preparation for the application of Alclad gloss black primer. 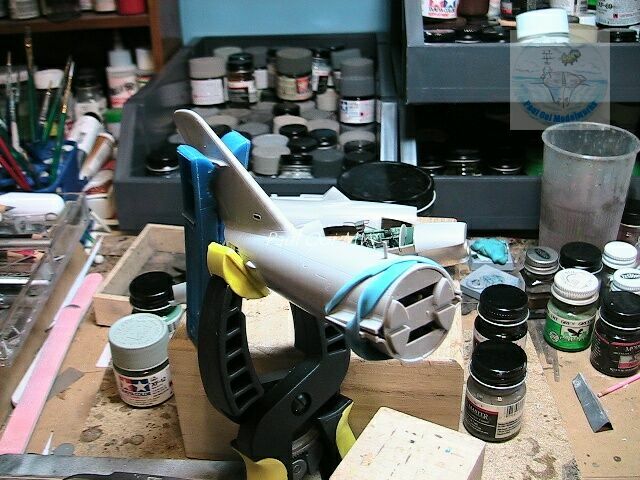 I also inserted a 3/8″ diameter wooden dowel into the tail exhaust in order to use a dowel as a handle for the next few painting steps. 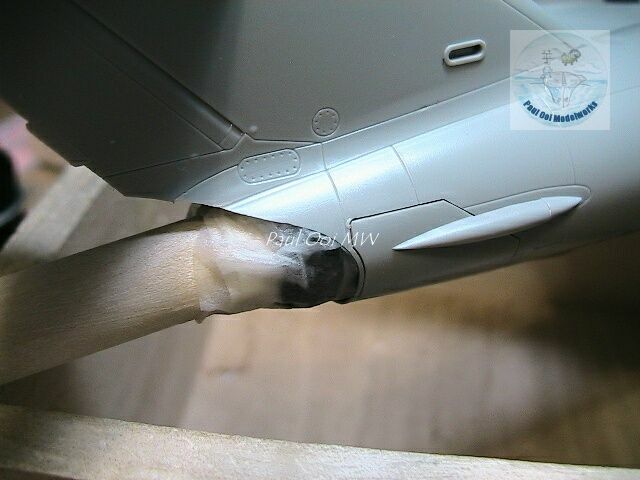 The exhaust section was masked with wet tissue as the metalizer paint used cannot withstand adhesive tape action. Following Allclad’s instructions, the glossy black primer was allowed to cure for one full day. After that, Allclad Polished Aluminum was applied in several thin mists, building up to a final shine. 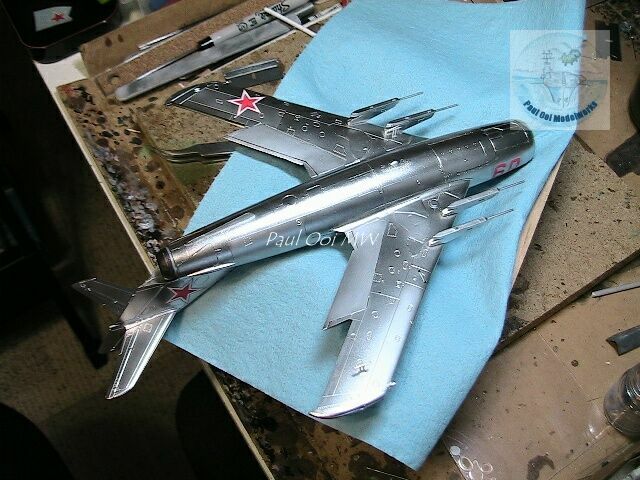 The polished aluminum should be lightly buffed with a soft cloth several hours after the layer dries. 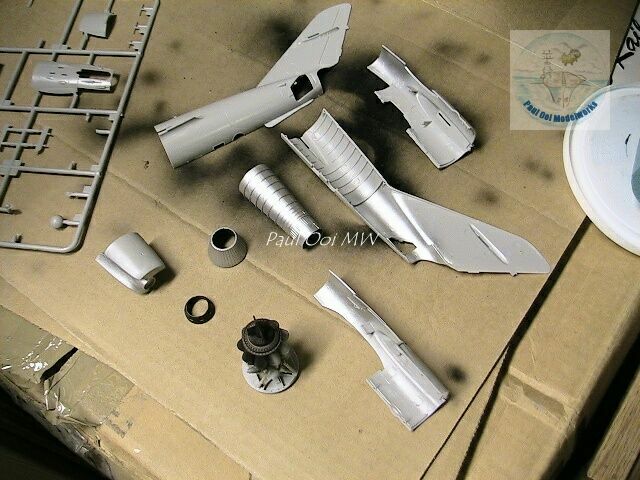 Once the main aluminum layer has set, I apply non-buffing metalizer aluminum in sections around the fuselage to provide the variation in individual panels as seen in actual aircraft. 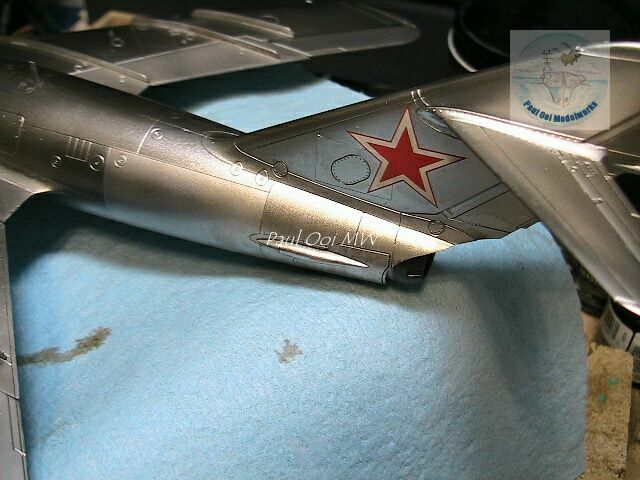 The decals are applied directly to the metalizer painted surface . After that, the entire work was coated with 2 layers of varnish and left to dry properly in preparation for the next surface treatment. 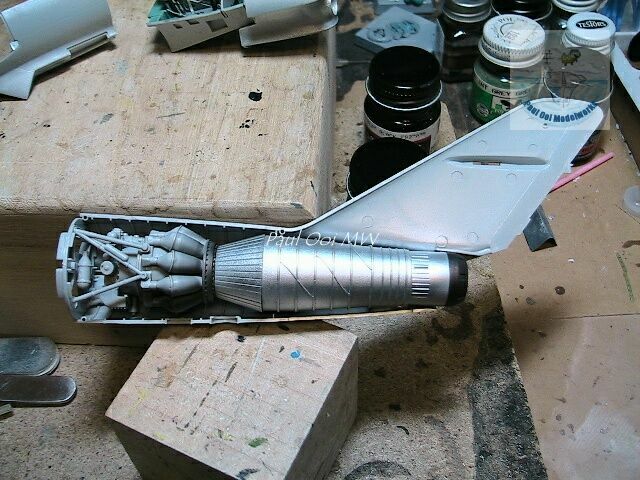 A wash of turpentine + dark grey oil paint was applied to the whole aircraft, then the excess is removed. This is followed by another wash of burnt umber near the rear exhaust. 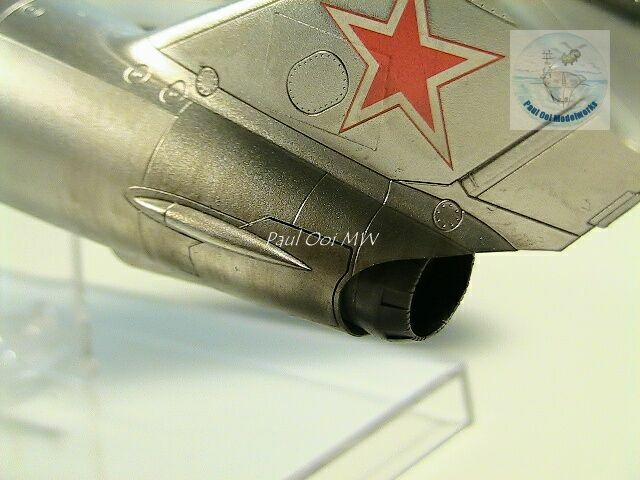 Then soot marks were airbrushed near the rear air brakes and exhaust. A final coat of varnish was then applied to seal in the paint work. After the final details have been added (antennae, navigational lights), the aircraft is ready to fly! The nose reminds me of the Sabre. The Soviets independently developed the slight nose bulge fairing to house the Izumrud all-weather radar. 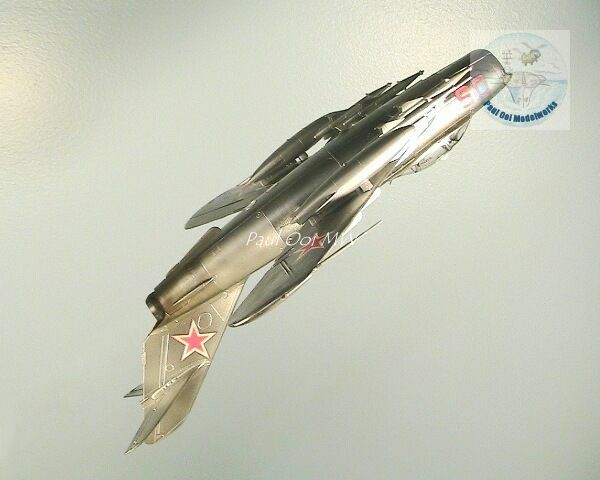 The real adaptation from the Sabre were the optical and radar gun sights that were reverse engineered from a captured specimen in Korea in 1951. The radar gun sights and cannon were deadly in close range dog fights in Vietnam.